Even before humans started building substantial shelters from stone, our ancestors applied pigment from plants and ashes to the walls of caves. 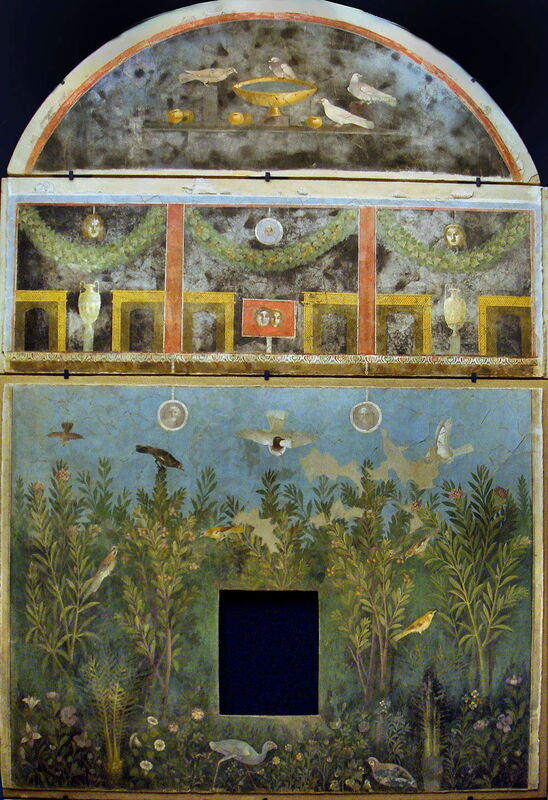 These were the first paintings to use what is now known as secco wall or mural painting. 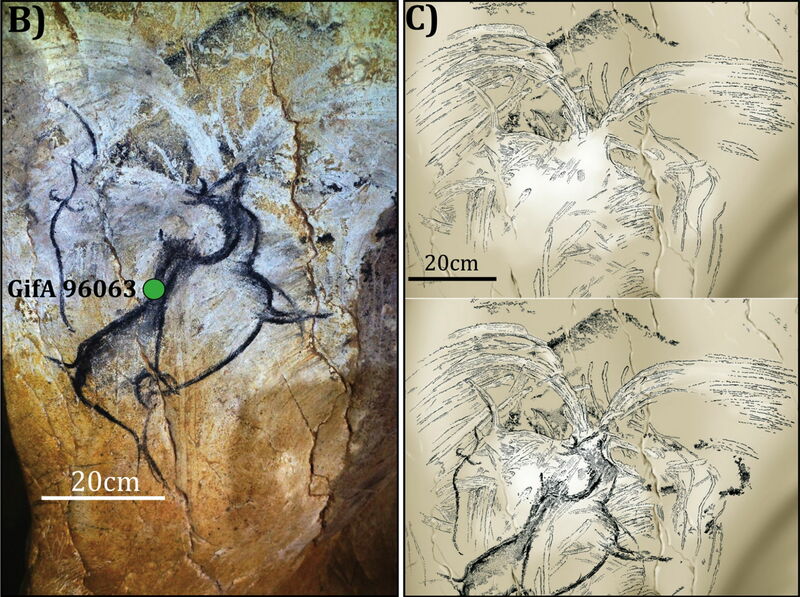 These paintings in the Chauvet-Pont d’Arc Cave in the Ardèche, France, have fortuitously survived for around thirty-six millenia, but they are an exception. Their support is the limestone of the cave wall, which isn’t in the least bit absorbent, so forms a very poor ground. It’s likely that the only binder which might have been used was human saliva, which is hardly going to provide much of a paint layer either. Artist not known, Christ Pantocrator (c 1200), secco wall-painting, dimensions not known, apse of Braunschweig (Brunswick) Cathedral, Braunschweig, Germany. Image by PtrQs, via Wikimedia Commons. Secco technique has been widely used outside Europe, and can still be seen in some very old European wall paintings, such as those in Braunschweig Cathedral, which are thought to date from the early thirteenth century. 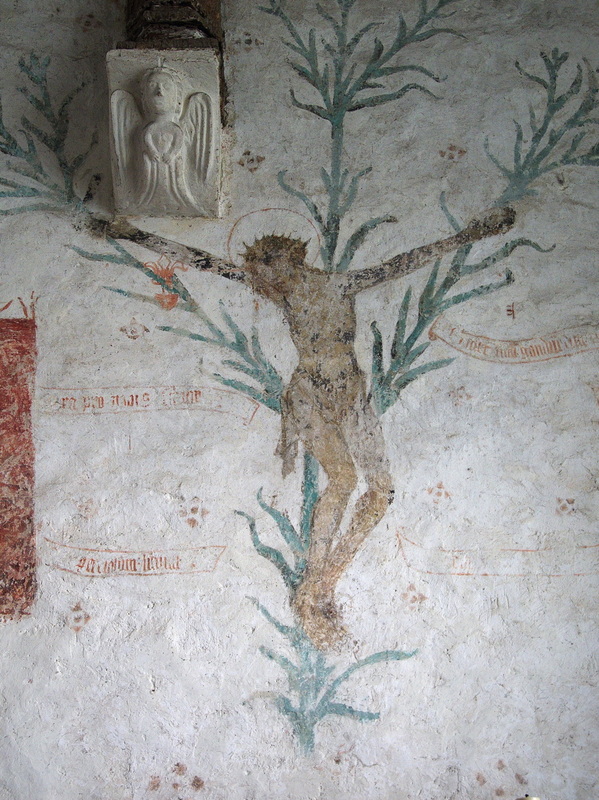 There are many vernacular paintings in places of worship across Europe which use secco on (dry) plaster, such as this Lily Crucifix in the parish church of Godshill on the Isle of Wight, England. Generally, though, the lack of adhesion between paint layer and ground is too limiting: only thin layers of pigment can be used, resulting in weak colours, little detail, and the need for periodic re-painting as pigment is gradually lost over time. Various artists have experimented with using different binders and secco techniques. Although dry plaster is more absorbent and a better ground than bare stone, success has been limited, and failure – most tragically and notably in Leonardo da Vinci’s Last Supper, in which he used oil paint and egg tempera on dry plaster – a constant danger. At some time before about 1700 BCE, one of the Mediterranean cultures discovered that it was possible to apply paint onto a layer of wet plaster, and the technique of fresco (strictly, buon fresco) was born. The Romans loved frescos which made their rooms look as if they were in a spacious outdoors, like these from the House of the Golden Bracelet in Pompeii. In fresco, the support remains the wall or ceiling of the building, but the ground is absorbent wet plaster applied to that surface. Pigment is diluted in water and applied directly to the ground when the latter is still wet; this allows the paint to be absorbed into the ground, providing good and durable bonding of the pigment to the wall. Plaster is made using lime, derived from crushed limestone, which sets by reaction with carbon dioxide in the air to form calcium carbonate (from which both chalk and limestone are composed) and water, which evaporates during drying. Techniques became even more refined, with the use of additional layers of plaster which are prepared in specific ways, to which red pigment named sinopia might be added, allowing the artist to draw in construction and other lines to assist in final painting. Because these frescos are on a grand scale, transferring the design of a painting from final sketch to the wall or ceiling is also challenging to say the least. The biggest problem for the painter is that successful fresco has to be painted onto the plaster when it is still wet. This means that only a limited area can be plastered and painted each day, known as giornate (singular giornata), a day’s work. For all but the smallest of ground-level fresco painting, work has to be undertaken at height, from a scaffold, posing the very real risk that the artist would fall, or the scaffolding fail. Many fresco painters have fallen at work, resulting in serious injuries and death. Despite all these practical difficulties, some of the most important European works of art are frescos painted during the Renaissance in places of worship with their high ceilings. 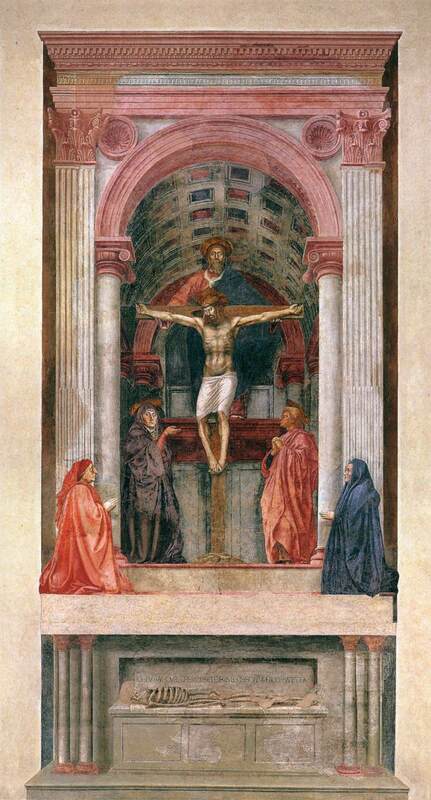 Masaccio’s magnificent fresco of The Holy Trinity in the Basilica of Santa Maria Novella in Florence was painted in 1426-28. Although we think of frescos as being fixed, this one has now been moved twice within the same church, which hasn’t helped its appearance. Study of its giornate reveals that they weren’t simple, ordered rectangles, but follow the structure of the painting. 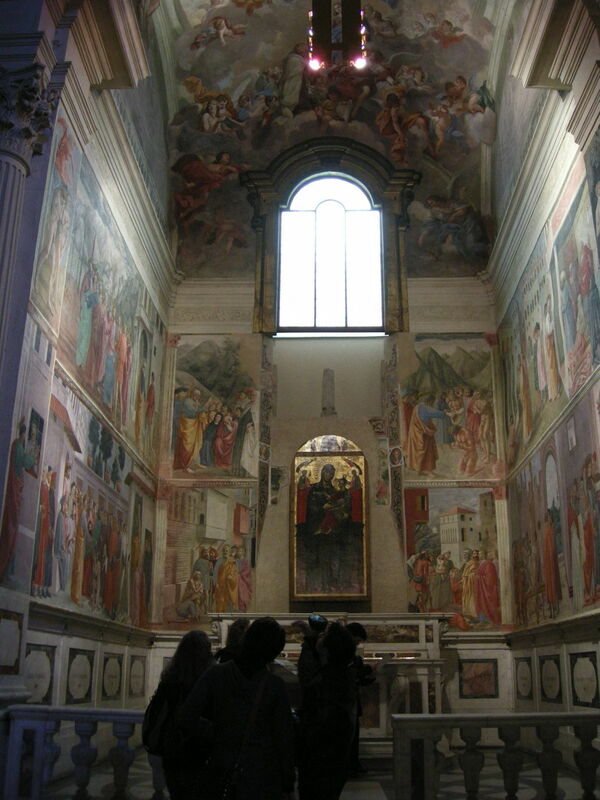 For the Brancacci Chapel of the church of Santa Maria del Carmine, Masaccio (1401–1428), Masolino (c 1383-1447) and Filippino Lippi (c 1459–1504) each painted sections in their turn. Because frescos cover such large areas, and are seen from a distance, their subjects are often broken into smaller scenes which can be painted side by side. Others attempt highly populated world-views, rather than the more limited contents of most easel paintings. 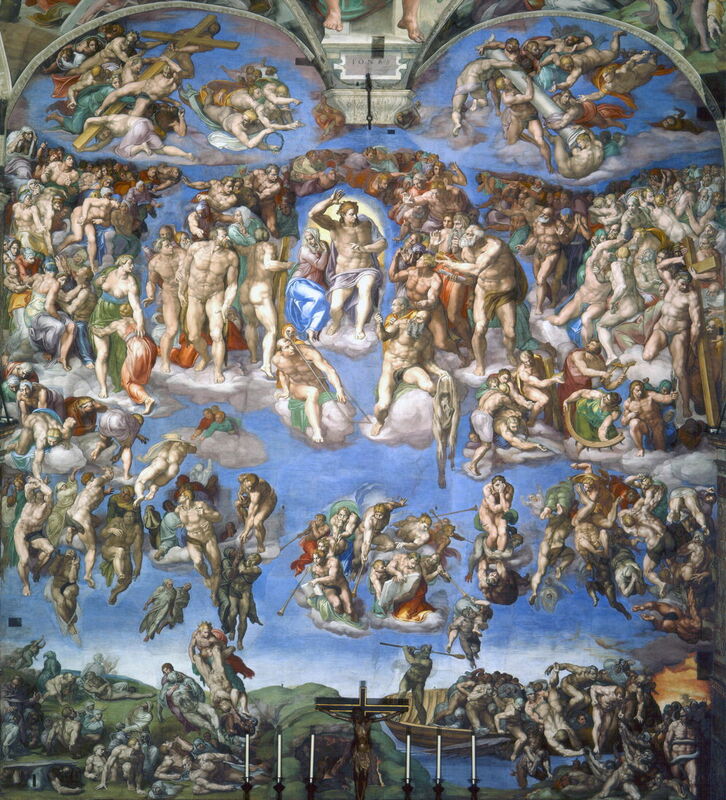 Perhaps the most famous fresco is Michelangelo’s The Last Judgement (1536-41) in the Sistine Chapel of the Vatican. 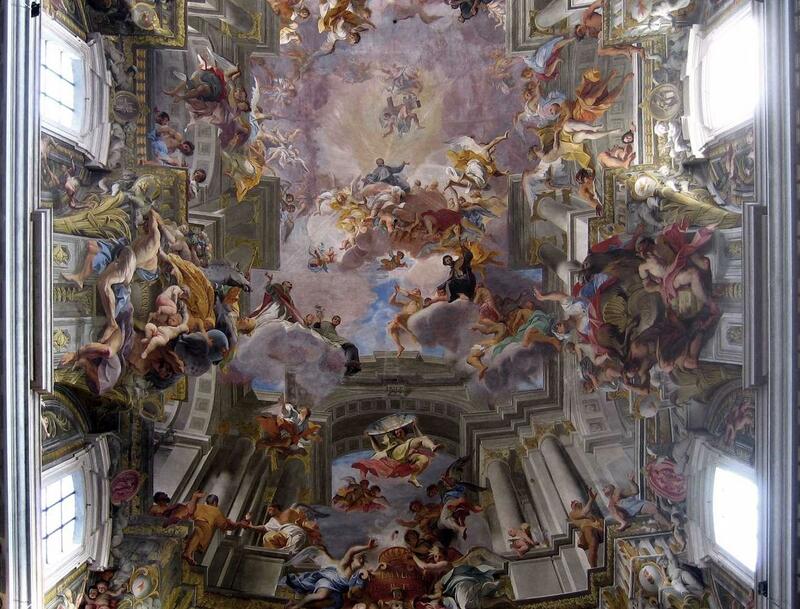 Ceiling paintings are even more specialist, and strong cadidates as trompes l’oeuil, as with Andrea Pozzo’s Allegory of the Jesuits’ Missionary Work (1691-94) in Sant’Ignazio, Rome. 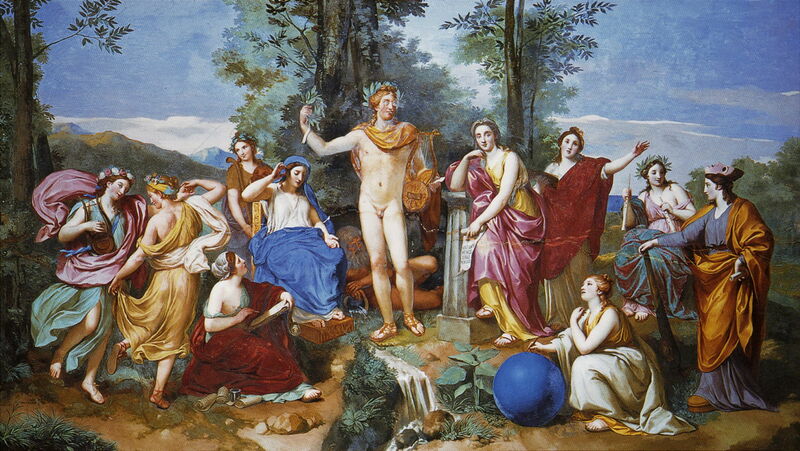 Anton Raphael Mengs (1728–1779), Parnassus (sketch for a fresco) (c 1760), oil on panel, 55 x 101 cm, Hermitage Museum Государственный Эрмитаж, Saint Petersburg, Russia. Wikimedia Commons. Preparatory studies made for a fresco can readily become recognised as works of art in their own right. 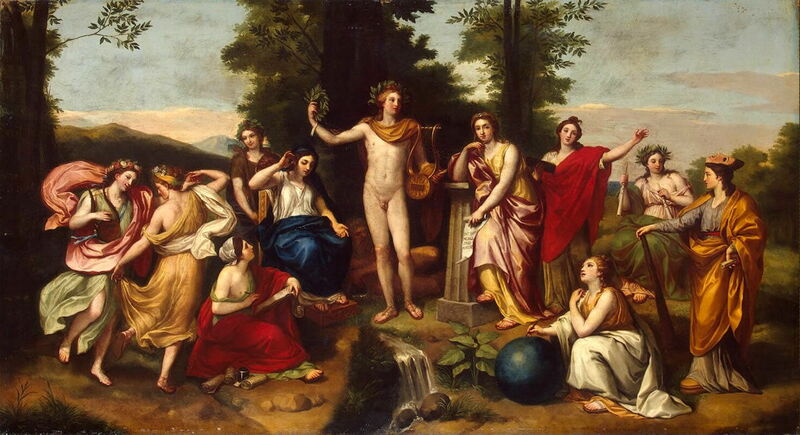 This study by Anton Raphael Mengs (above) was enlarged over five times to become the fresco of Apollo, Mnemosyne, and the Nine Muses below. In the eighteenth and nineteenth centuries, fresco became relatively neglected. 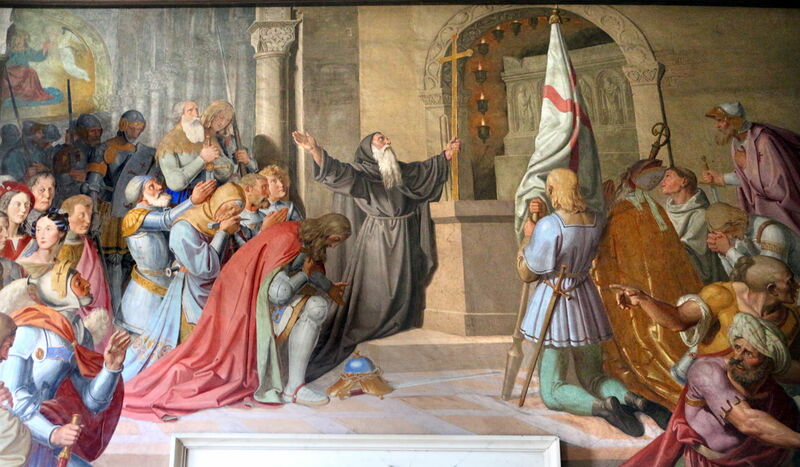 Some new frescos were commissioned for places of worship, and other public buildings, and in the early nineteenth century Johann Friedrich Overbeck painted a series of frescos telling the story of Torquato Tasso’s epic Jerusalem Delivered, in the Casa Massimo, Rome. There are similar series showing Dante’s Divine Comedy and other long narratives, which are particularly suited to fresco. 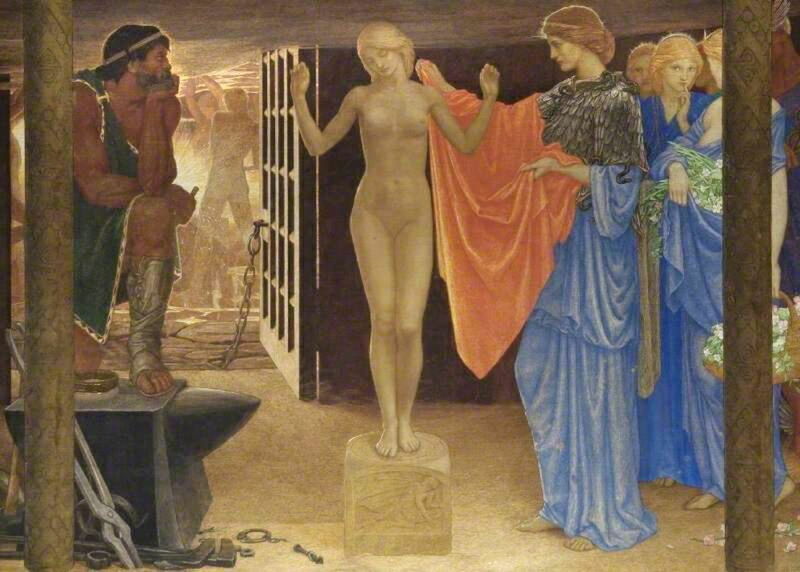 John Dixon Batten (1860-1932), The Creation of Pandora (1913), tempera on fresco, 128 x 168 cm, Reading University, Reading, England. Wikimedia Commons. 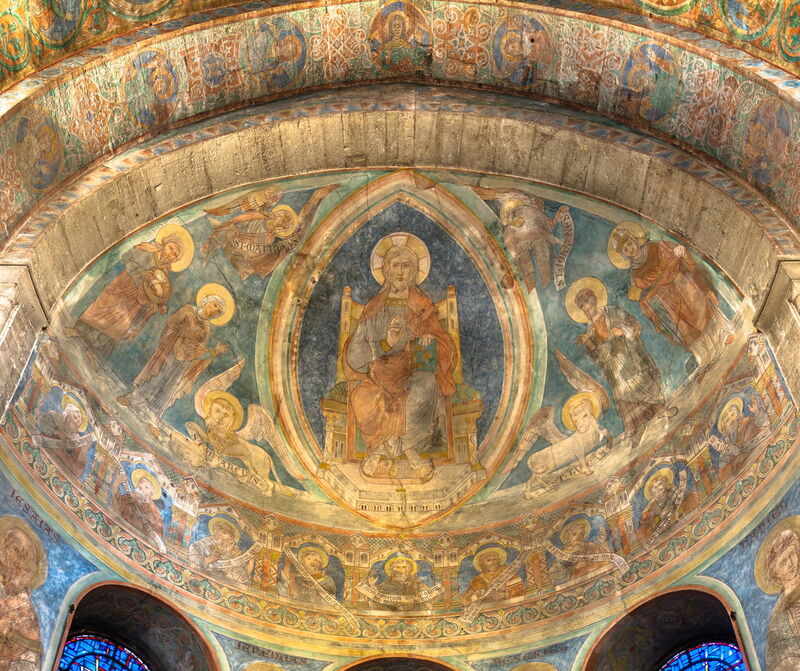 Frescos have continued in religious painting, with artists such as Sergei Fyodorov painting them in churches and cathedrals, and for the occasional trompe l’oeuil. John Dixon Batten’s The Creation of Pandora was painted anachronistically in egg tempera on a fresco ground by 1913. Batten was one of the late adherents of the Pre-Raphaelite movement; this painting was deemed unfashionable in 1949, and was put into storage and quietly forgotten until its rediscovery in 1990. 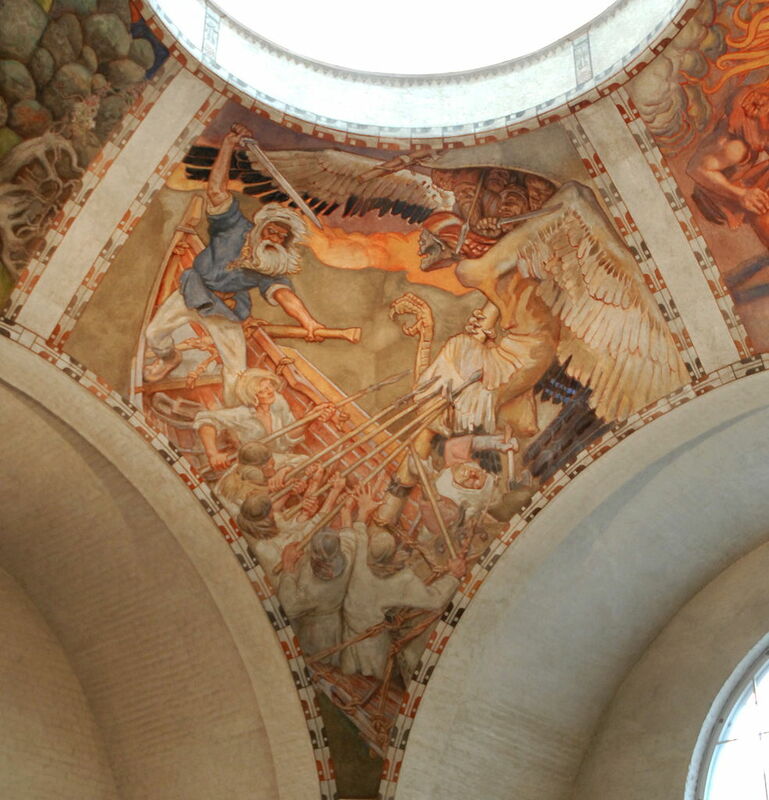 Akseli Gallen-Kallela (1865–1931), The Defence of Sampo (part of Kalevala Fresco) (1928), fresco, lobby of the National Museum of Finland, Helsinki. Photo by Jean-Pierre Dalbéra, via Wikimedia Commons. New frescos are still painted in some public buildings too. This work by Finnish painter Akseli Gallen-Kallela is one of a series which he painted in the National Museum of Finland in Helsinki in 1928, and there are spectacular wall paintings by John Singer Sargent in the Boston Public Library in Copley Square, the Widener Library of Harvard University, and in the Boston Museum of Fine Arts, for instance. Frescos aren’t the only way of making very large and monumental paintings for places like churches, though. The walls of Venetian buildings are particularly unsuitable for secco or fresco, because they remain so damp all year round. Hence the painters of Venice were innovators in constructing very large canvases, and you will find few frescos there as a result. Posted in General, Life, Painting, Technology and tagged Batten, fresco, Fyodorov, Gallen-Kallela, Masaccio, Mengs, Michelangelo, Overbeck, painting, Pozzo, secco. Bookmark the permalink. Actually, the Venetians painted on the outside of many buildings there and as they deteriorated they were removed to a museum dedicated to such. Thanks – yes, they did, and sadly most of the external frescoes painted by the masters have vanished now, apart from those few saved for the museum. But there wasn’t anything to compare with the frescoed chapel interiors elsewhere in Italy, and the hostile climate was the main driver for the development of large canvas supports as used in most of the churches and other painting-rich buildings. Of course, they could only go indoors.